In order to expel impurities and toxins from your lymphatic system you need to keep the lymphatic system healthy and active by practicing healthy lifestyle habits that support a healthy lymphatic system. Without practices that support a healthy lymphatic system the lymp system becomes clogged and lymph nodes become swollen which can lead to many other health issues. If your lymph nodes are swollen it is a strong sign that you have not been engaging and keeping your lymphatic system active and healthy so if that is you pay special attention to the advice in this article. 1. Drink Enough Water: If you are not hydrated your lymphatic system doesn’t have the lubrication it needs to detoxify and drain (expose of) impurities. Staying hydrated ensures that your lymphatic system has the fluids it needs to flush toxins into your kidneys and liver so that they can be expelled from the body. Drinking enough water is the first and foremost most important step to take to move lymphatic fluids. The word Lymphatic actually comes from the Latin word lymphaticus, which means “connected to water” so drink more water! Drink at least 50% of your body weight in ounces of water each day. For example, if you weight 120 pounds drink 60 ounces of water daily. If you weight 160 pounds drink 80 ounces of water daily. 2. Move! AKA… Exercise: You need to move your body to move your lymphatic system. Remember how the lymphatic system is like the circulation system, just without a pump (the heart)? That means that you need to physically move every single day to continuously keep your lymphatic system active. If you are too sedentary your lymphatic system will become clogged and it will begin to soak up toxins like a sponge. By exercising you squeeze/rinse your lymphatic system very well along with proper hydration. Brisk walking works well as a start, as well as aerobic exercise such as swimming, biking, running, playing sports etc. One of the best exercises that you can participate in is to rebound. Rebounding is jumping up and down on those mini-trampolines that i’m sure you’ve seen. <<< They look like this. Rebounding exercises every cell in your body and uses the force of gravity to your advantage to move your lymphatic system. This is not only great for your lymphatic system but it also helps strengthen your legs and give you more flexibility in your lower body as well as move and circulate your entire body. Your circulation and cellular health are very positively impacted by rebounding each day for just 15 minutes. 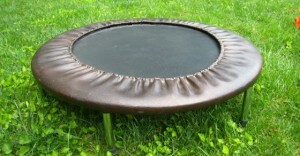 You can get a rebounder on amazon or shop around by clicking here. 3. Breathe Better: Most of us live in a fast paced world with many external stressors. This causes us to breathe shallow in our chest as opposed to in our stomach breathing deeply which is what we really need to do. Breathing deeply into our belly gives our body more available oxygen to use throughout our entire body. With hydration and oxygen our body can better drain and detoxify the entire lymphatic system. Additionally laughter is one of the most beneficial ways to breathe better and it has so many benefits, it stimulates the negative pressure within the thoracic duct (this is the largest lymphatic vessel in the body). The speed of flow of the lymphatic fluid increases up to 10-15 times its normal rate. Not only that but laughter helps to boost immunity which works closely with the lymphatic system. This deep “laughter breathing” benefits your whole body with more oxygen and endorphins (feel good chemicals) as well. 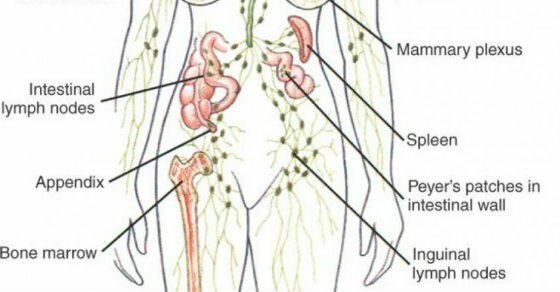 Helping your lymphatic system distribute fluid and nutrients throughout the body better. Remove excess protein left behind by your circulation, preventing tissue inflammation. Removing excess toxins within your body. Spend more time drinking enough water, going for walks and engaging in physical exercise and breathing deeply with those awesome belly laughs. Each of these helps your body flow better (water, oxygen and laughter) so by being in a state of flow with less stress and more positive movement you help your lymphatic system drain as well. Do something in your life that serves you and the planet and you’ll feel better by the day.